Well today IÂ´ve shown my final degree project at the university. Whant to thank to Hansel for his help in this project. And to Lioric for the fantastic tool oFusion. Last edited by Paulov on Thu May 24, 2007 11:53 pm, edited 3 times in total. Yeah, that's amazing! 18 and 19 in particular... Wow. Wow, any chance to marry this project with Rigs of Rods...? Did you have to do anythign special with regards to paging geometry in or out? QuantumG mentioned that he managed to fit a large part of GTA3 in a single scene without paging, i was wondering if you shared his experiences. Pathman, Free (as in GPL) 3D Pac Man. Wow, can you tell us more about what your doing? Is it a game, simulation, etc? >>Do you have any videos? nop. How can I capture a video without compromising the 3D performance? the times IÂ´ve tried to do this with other works, I noticed that the framerate droped a lot. I would be pleased if someone could tell me what soft to use and wich config works fine. >>Wow, any chance to marry this project with Rigs of Rods...? Thanks a lot for thaht proposal, but now I would preffer to burn the tires of the Toyota. IÂ´ve to speak with the programmer that has helped me on this project to see what can we do first. Thanks again for your proposal and feel free to PM me for anything related to this. >>a)Did you have to do anything special with regards to paging geometry in or out? b)QuantumG mentioned that he managed to fit a large part of GTA3 in a single scene without paging, i was wondering if you shared his experiences. --> a) well dont know very well what you mean since IÂ´m an artist and dont know much about programming_ _ but I understand that you ask me if I have had the need to load different parts of the area in a similar way of a LOD. The answer is no. There is no LOD or paging in this visualization. b) I readed something about in the forum time ago, but .... well, no pagin no sharing. The scene has 200.000 polys. And runs smooth in my 7600GT. >>Wow, can you tell us more about what your doing? Is it a game, simulation, etc? -->This work has been the final project in my university where IÂ´ve studied construction engineering // Arquitectura tÃ©cnica pa los que hablen mi idioma //. The aims of the project where from one side to show how realistic an urban area can be build, and to show the aplications of this kind of technologies in the construction/engineering area. In the project presentation, I showed how the status of the river would be if a modern bridge was settled in there. Its a recreation of an area in the city of San Sebastian located in the north of Spain. IÂ´ve bugfixed the model and added a couple of videos. Looks like I missed a great project! Nice! By the way Paulov, what tool/workflow have you used to model the city? I've just seen the videos and looks incredibleble!! Hey, glad to see you got past your weird texture problems in ofusion . BTW Ofusion does do LOD, but its only automated %, you can't have manual LOD meshes. (Something I requested not so long ago). Not at all, look, I posted that those problems where showing in max viewport, then in the compiled scene works fine. I posted the log too. I think it is a mipmap problem since I can see the "lines" that create mipmaps with different texture "resolutions" and the first one shows ok and the second (and following) show super weird. BTW Ofusion does do LOD, but its only automated %, you can't have manual LOD meshes. (Something I requested not so long ago). Your city scene looks very nice indeed. ---> This would be great!!! what tool/workflow have you used to model the city? IÂ´m "arquitecto tÃ©cnico" & plan drawer (delineante) o as you might imagine I master CAD software, with is very hadfull for this kind of works. I prepare most of the data in AUTOCAD and then modelled it in MAX. Modelling this part of the city has required a considerable ammount of "in site" data adquisition, that sometimes could have been automated but not in others. IÂ´ve used a laser telemeter to measure unreachable distances-points and to measure urban elements. IÂ´ve tryed to make the modelling part as simple as possible and the main modifiers have been "extrude" and "face extrude". 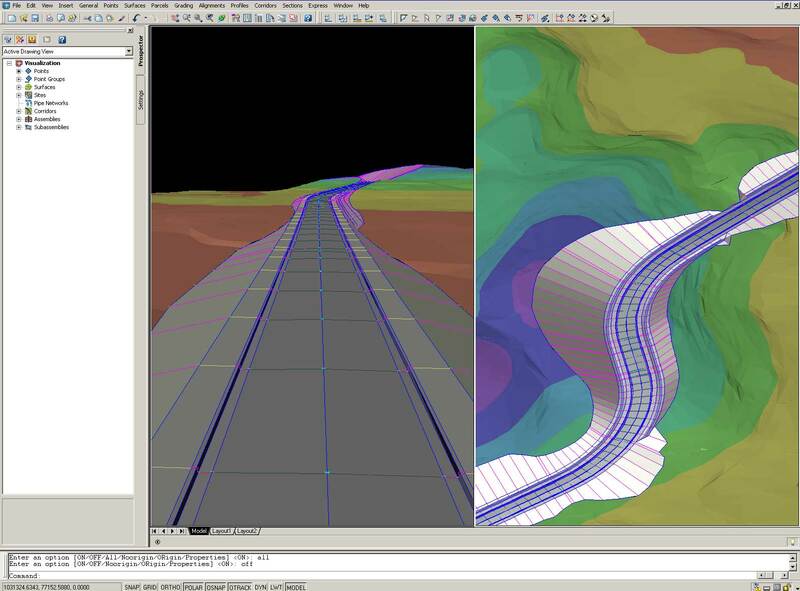 IÂ´ve spend a considerable ammount of time preparing the data in Autocad. And even more developing the technics of preparing this data. Feel free to PM me asking whatever (en espaÃ±ol calro) and I can give you more detail, but not all eh, IÂ´ve spend much time developing the workflow.. Even the data preparation is hard, if you wat a big, city, YouÂ´ll have to be serious in storing everything very indexed, and create a "metodology" (no se si existe esa palabra) so that you can reach your models easyly and you store them sistematically. Developing "plain" areas is easy, but drawing the highway in the part that it "rises in altitude" has been painfull. Also I see difficult that I could model easily areas that are not horizontal or have variations. Because of that IÂ´ve started to learnd Civil 3D software so that I cand draw Highwais , roads etc without melting my brain i those processes. Now I know how to do it. I love HDR, thanks to HANSEL, it looks IÂ´m near to seeing it ont he city. I love the mirroring effect of the windows. After the last demo-scene lioric posted on the wed I got it, IÂ´m finishing the testings. The effect si fantastic. now, thanks to EVAK it looks near. Well, when modelling a city, "custom" LODs are a must, for street lamps, traffic posts, etc, that otherwise cant be placed. I think that is is one of the major lacks of OF from my artist point of view. I saw that in google of summer, it was a project named "instancing of crows, or similar, dont know if it is already aplicable, but would be great to do pedestrians without much "power" consumption. One of the important part to get this project finished whas the programmer:: : because otherwise I see difficult that I could have shown the ressult. Hansel, (ogre Forum member) whose name is J*** M*** A**** has helped me on this project. Thanks all for your interest & comments !! Those roads are probably done through some kind of CAD/MAX plugin, usually by projecting a spline on the terrain and supplying a profile shape. Regarding crowds, hardware instancing and procedurally spreading them across the streets would be really nice. Indeed, an advantage of doing this way is that you can place them only where the camera is looking in real time, having very crowded streets with a constant relatively low performance hit. Blender *can* be used for architectural modeling (CAD) - I saw a couple of entries on BlenderNation about that. InkScape is a great CAD tool which works in Linux too - and you can import InkScape files into Blender..
jacmoe wrote: Blender *can* be used for architectural modeling (CAD) - I saw a couple of entries on BlenderNation about that. well, I dont know about those softs. You dont need to have Autocad, but yes a CAD soft that supports DWG or DXF , (most do). I find that moving data from autocad to max is extremely easy (once the import settings are set up). Also MAX supports X-ref that means that you can call a scene and load in the one you are viewing, but you cant modify this scene, only see, it. And then when ou modigy, youÂ´ll see the changes in the one you inserted it. This is a must for large scenes. It is very used in CAD projects. Ofusion is supossed to export X-ref, but in my CE version it does not work. MAX is for me the soft for developing a huge, (in extension and detail) enviroment. Ah, oke, interesting what you said about instancing, so its like in GTA, that you saw an interesting car, and if you lose it from your sight of view you "lost" it. May be instancing would be also interesting for Those street lamps etc that are always in the same position. Would be something similar to the X-ref I mentioned before. The idea would be similar to GTA, yes, but not only depending on the distance, but the whole field of view. Imagine you put pedestrians in a grid distribution across the scene. If you're looking north, you won't need to even instance those behind you!